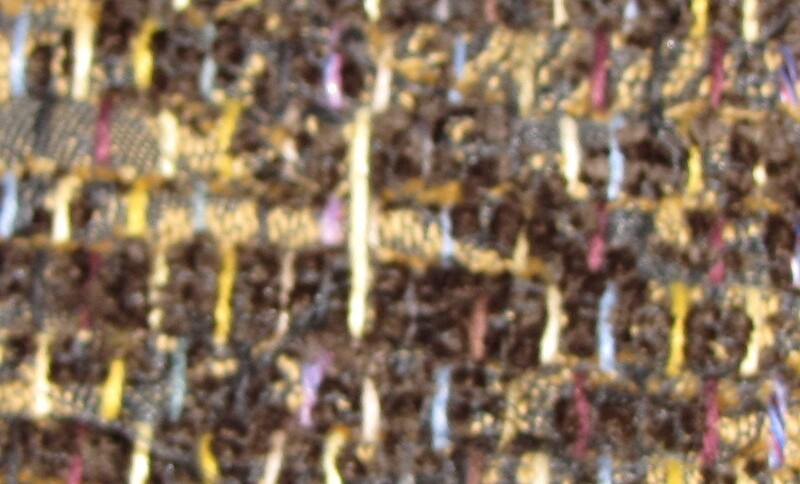 Here we have a warp thread that was not captured in the weft during 1 pass. I’ve decided to continue highlighting my weaving mistakes and how I go about fixing them. I hope everyone gains some info, perhaps even amusement, from these posts. I know I enjoy putting them together. In this post I want to point out a mistake on a finished rug. This particular rug is made out of upholstery selvedge, my first such, and it turned out quite rich and lovely. While prepping it for a show (vacuuming, measuring, and tagging), I saw I had a mistake. I was tempted to set it aside to deal with another time, or perhaps to be the first of what would eventually be the bargain bin. But then I decided that a lazy Saturday afternoon was really the most ideal time I would ever have for fixing it, and it really was a sweet little rug and deserved the extra attention. Cut the thread and then back out the warp thread a few inches. Measure out a repair thread. So, as you can see from the photo, I have a yellow warp thread that was missed during one pass of the weft, creating this solid line over 3 passes of weft. I dug out the matching warp thread spool from the stash and set to work. First, I had to cut the errant thread and then I used my tapestry needle to pluck it out of the weave in each direction over 3-4 inches. Pick an end, tie in the repair thread. Then I hazarded a guess as to how much replacement thread I needed by measuring out the distance plus half again with loose thread from the spool. Keep in mind you will want plenty at either end for tying in and also that the replacement thread will be pulled tight once you weave it in. Then I picked an end and tied in the new thread, leaving a tail ~3 inches long to tuck in. Using the tapestry needle once again, I tucked in first one tail (from the new thread) and then the other tail (old thread). Each one is woven in perpendicular to the warp and parallel to the weft, using the needle to weave it in and out of the warp. With tapestry needle, weave in the tied off ends. I found this goes much smoother if you have more thread to play with than you actually need, as your tapestry needle needs some give to maneuver in and out. 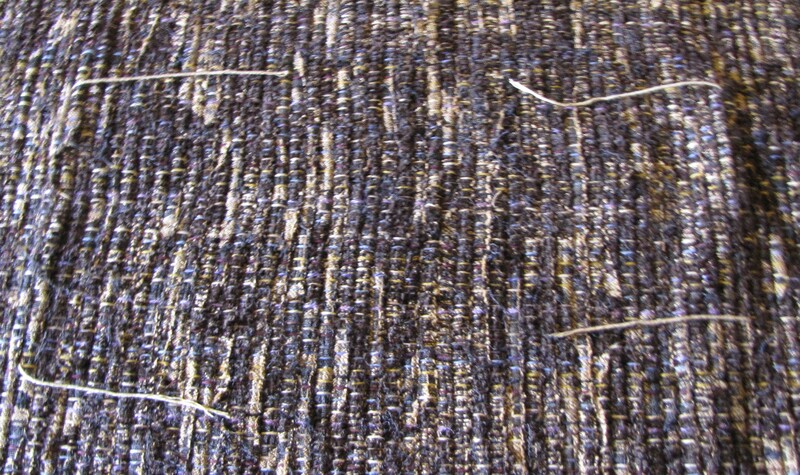 Also, I find it easier if I bunch up the rug a bit, creasing along the weft where I have chosen to weave in the tail. A few choice words later, and you have tucked in your ends. 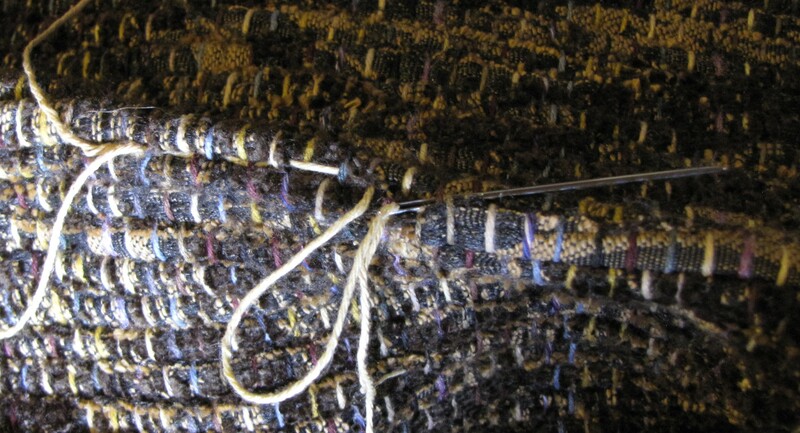 Using tapestry needle, guide the repair thread in & out of the weft. 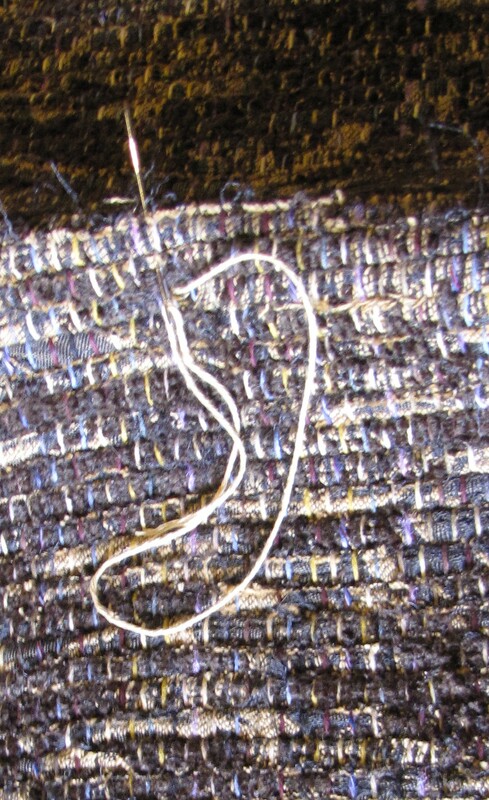 Next, I used the tapestry needle to weave the new thread along beside the other warp threads to the other end. You need to make sure you weave it in the proper location. Having tucked in your ends and pulled them tight, you may have pulled the knot where you tied in to one side or another. So, check just by pulling on your your knot to verify which other two warp threads your old thread sits between. This is where your new thread should sit as you weave it in & out of the weft. Once you have woven it in, pull it tight, but not so tight as to be tighter than the surrounding warp, as that would look odd and wash & wear funny. Tie in at this end and tuck the ends in as you did on the first end. Once complete, you are ready to snip off the ends of those tails – without snipping any other warp threads, otherwise you will get extra practice at this process ;). Once the repair thread is woven in and attached at both ends, you are left with the tails of the tie ins. Completed, I could not easily tell that I had spliced in a bit of thread to correct my woven mistake. How did this mistake come about? I’m not sure on this one. I have seen it happen (and caught it on the loom so I could fix it there by unweaving and reweaving) when a nearby warp thread had a knot with long tails (potentially from tying in a new spool when warping the loom) that tangled in the thread in question, back in the heddle, holding it down when it should be up, causing the weft to skip the warp thread until it becomes untangled. In this case, I am not sure as there was not a knotted warp thread nearby to this mistake. Whatever the cause, at least it is fixable with ~10 minutes effort and a few cuss words every time I jabbed a thumb with the tapestry needle. Once repair is made and tie in tails trimmed off, this is what it looks like. To Sew The Ends Or Not? If you don’t sew the ends, you need to overlay perhaps 3 inches or more. Recently, I made my first cotton rugs. For all three of them, I mixed each, having two distinct colors twining through each rug. 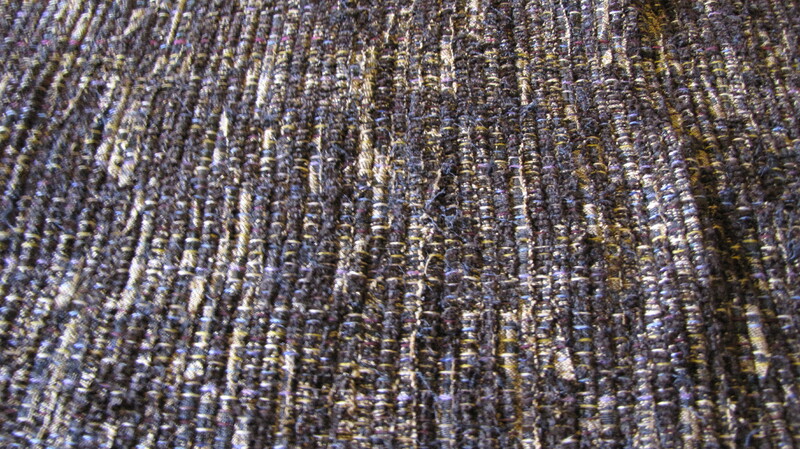 On the first one I had this lovely deep golden selvedge edge material that would be remarkably boring all on it’s own. But then I also had this softer, pastel yellow in strips (that would also be remarkably boring by itself). I decided that they should be smushed together into one beautiful rug. Here you can see an end that escaped the warp. I also made the snap decision to not sew the pastel yellow strips together into long lengths suitable for filling a shuttle. My mom, Sandy Voss of Cabin Textiles, has does this before too and prefers sewing the ends for several reasons. She strongly recommended that if I wasn’t going to sew the ends, then I needed to give them a lengthy overlap of at least 3 inches. This is done to help ensure that the ends won’t wriggle free over time (think the type of usage such a rug might see) and create a hole in the weft. 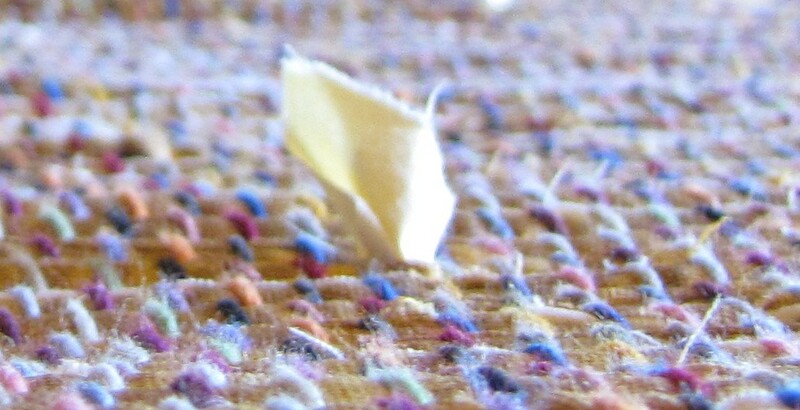 Additionally, unsewn ends are more prone to sticking up through the warp and will require a little trimming before the rug could be considered ready for sale and/or use. From my personal experience of making this rug, I found it a pain in the backside to lay each pale yellow strip in and fuss with the overlapping ends. I think it doubled the amount of time it took me to weave this rug. I also had a very direct comparison to the selvedge edge I was twining with it – it being one unending streamer of deep gold. This selvedge edge laid in swiftly with minimal fussing. Here is a simple blue & white cotton rug. The next two cotton rugs I made, I sewed the ends of the blue bedspread strips. Yes, it took me a little while to sew all those little ends, but it saved me time and hassle on the weaving side. Plus, I feel that it makes a more durable product in the end. Those sewn ends are not likely to worm their way out over time, even with many, many washings, and create a hole in the weft. Also, I found there were way fewer little ends that stuck up upon vacuuming that needed a trimming.